The leaves are turning yellow, orange, and red. Daylight hours are getting shorter. In the evening, the air is crisp and cool. You know what that means—time to grab the rake! DO make a pile and jump in! DO use your leaves to help feed your plants and garden. After you finish jumping in the pile, put leaves around your outdoor plants or use as cover in your garden plot. Or add them to your compost pile. 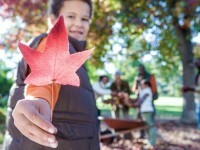 DO check with your community about its leaf collection plans. If you still have leaves left over after using them in your yard, find out if, when, and how they are collected in your neighborhood. DON’T rake leaves into the street where they can clog storm drains. Leaves can cause streets to flood during heavy rains. DON’T burn leaves. Burning leaves may be a violation of your local laws and could incur a fine. Plus, it creates air pollution that is troublesome for those with breathing difficulties. DO enjoy the delicious smell of fall leaves and the crackle they make underfoot while you are out in your yard on a gorgeous fall day!